You will be pleasantly surprised by the Kilima Kidogo guesthouse which is situated on a beautiful beach front property on the East Coast of Zanzibar. Dina, co-owner of Kilima Kidogo, and her 15 staff members will spoil and pamper you to a great Zanzibar experience. This 8 double room guesthouse is wonderfully set with a open plan living area where guests can relax, read and play games. The pool table and dart board offers great entertainment for everybody. Smaller tables for board games are placed so that guests can be part of the atmosphere created, yet can also feel separated. The doors of this living area opens to the most breathtaking views of the beach and sea. 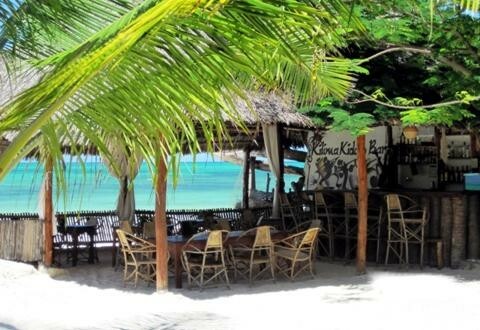 The Restaurant/bar is nestled under a makuti thatch roof bordering on the beach. 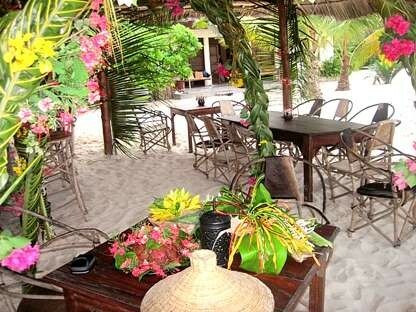 The SPA is also nestled under makuti thatch roof bordering the beach. - 2 cottages: 1 Garden cottage with double bed, mosquito netting, air conditioning, ceiling fan, en-suit bathroom with hot water and safe. 1 Upstairs Room with sea view. The room has a double bed, mosquito netting, no aircon, ceiling fan, en-suit bathroom with hot water and safe. This cottage is ideal for the younger generation. Tours and day trips are organized at Kilima Kidogo together with a licensed tour operator. Beautiful swimming pools in the sea in front of the house and beautiful snorkeling places on our doorstep. Games. Pool table, darts, board games, puzzles, a bookshelf filled with a variety of reading material. 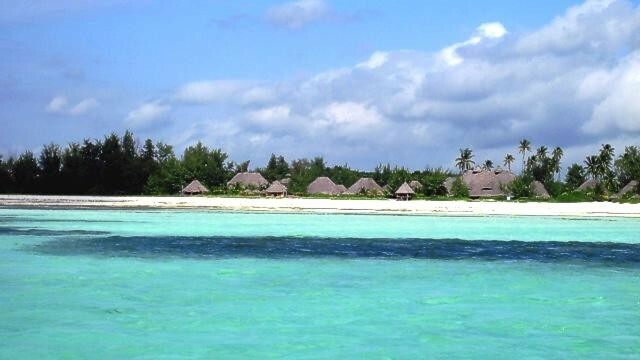 Dina and the staff of Kilima Kidogo are at your assistance while in Zanzibar. Relax and enjoy all that Kilima Kidogo and its surroundings has to offer. Day trips and daily activities are arranged at Kilima Kidogo at very good prices. 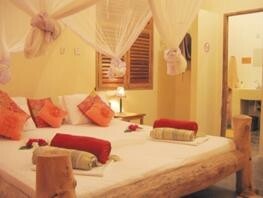 Kilima Kidogo is situated on a beautiful beach front property on the East Coast of Zanzibar island. 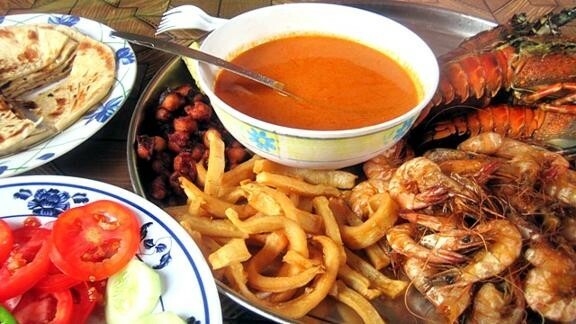 Our guesthouse is in between two villages - Paje Villages, 15 minutes walk to the north along the beach and Jambiani Village, 15 minutes walk to the South along the beach. We are close to these villages, yet private. 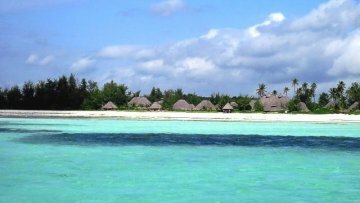 Kilima Kidogo offers a holiday along white sandy beaches fringed by a turquoise sea, ideal for swimming and relaxing on the beach. Whether guests seek a tranquil relaxed getaway with sun drenched beaches, a luxurious beauty spa and a beach bar/restaurant or a hive of activities of day trips and tours around the island or snorkeling, kite surfing, diving, beach volleyball and of course beach football, the local favorite, there is always something to enjoy. Whatever your preference, you will find it at Kilima Kidogo.